Scotland Whale Watching is the Thrill of A Lifetime! For anyone who loves the sea, or even better, the sea's creatures, Scotland Whale Watching is the trip of a lifetime for you! I cannot think of a more stimulating and exciting outing than a trip from Mull, Oban, the Isle of Skye or any of these mystical Western Isles to go whale watching. Even if you didn't see anything except a seagull it would be fun..! but there are now a host of different organisations that offer trips to see such creatures as orcas, minke whale and even basking sharks..now that would be a Day Out! Twenty four species of whales, dolphins and porpoises have been recorded by folks out whale watching throughout the west coast of Scotland. There are also a host of different seabirds and grey seals. 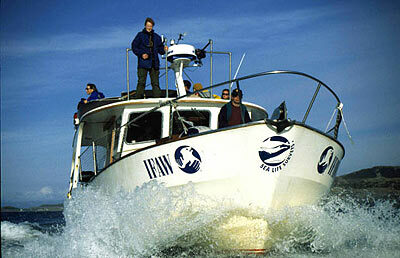 Anyone who thrills to the sight of a dolphin will really enjoy these trips. 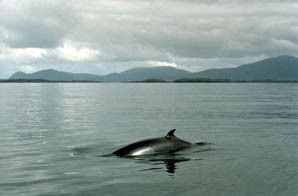 Minke whales are the smallest of the rorqual family, and are currently the only whales still being openly commercially hunted, though not in Scottish waters.Minke whales feed on fish and krill, travelling singly or in groups of 2 to 4 individuals. Their breeding period is from December to May. 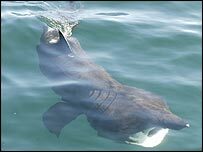 Basking sharks are so called because they are most often seen when feeding at the surface and appear to be basking. Although they are quite huge and scary looking, they pose no threat to humans as they eat plankton. Normally the basking shark reaches a length of between 6 metres (20 ft) and a little over 8 m (26 ft)but some surpass 9 or even 10 m.They prefer waters between 8 and 14° C (46 and 57° F) and are often seen close to land and will enter enclosed bays. They will follow concentrations of plankton in the water column and are often visible on the surface. They are a migratory species leading to seasonal appearances in certain areas of their usual range. In Scotland a common sight is the charming grey seal..you can often spot them on the sandbanks. We found a baby one on the beach once.